So maybe I'm playing house, I thought, after reading about Cintitta, a former priest here who has taken his practice many steps further than most others I know. It was the feeling I had, in Rome, looking up at the Sistine Chapel and wondering how I can compete with that energy (I wasn't so excited about it as a work of art). The article on Cintitta talked about one who was "walking the talk." I look forward towards spending some time with him in a couple of weeks. And then, on the other hand, we hear that one can "practice" anywhere, anytime. John Cage wrote music in Grand Central Station. In the meantime, I'm trying to move away from anger and judgment. I'm tired of both. Very tired. The priest today made a neat statement today, "As simple and impossible as it sounds, meet everything that arises with an open and curious mind, and a loving and forgiving heart." Following this, anger is impossible. As I sat this morning, thinking of this quote, the holocaust came up. 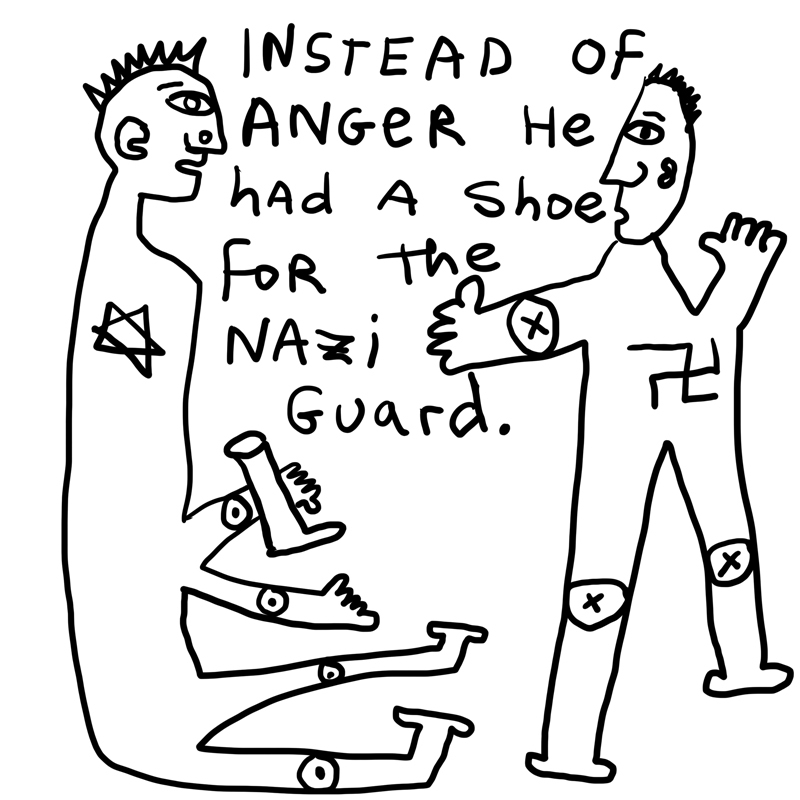 I thought, how can one feel anything but rage and anger about what the Nazis did? 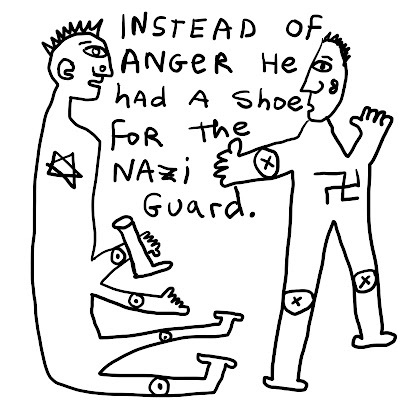 And then I remembered that, upon their release at the end of the war, some of the concentration camp survivors gave shoes to their captors. They opened their hearts to those soldiers who were, in many ways, victims themselves. I read ‘Left to Tell’ by Immaculee Ilibagiza. It’s her story about her experience in the Rwandan genocide. She was locked in a bathroom for several months, hidden away so that she would not be killed. She talked incessantly about the need for forgiveness and moving away from anger. As I read this account, I remember thinking, “If this chic doesn’t get pissed-off at some point, I will not believe a word in this book.” Finally in the second to last chapter, she wrote how she wanted to ask the UN peacekeepers to douse the remaining houses with gasoline and let her light the match. And I thought, “Thank gods! Finally, a real human emotion. That’s a real breakthrough for her.” Rest assured, she didn’t burn anybody. I really feel that if one does not get angry in certain situations, something is very wrong. I don’t think it is possible to ‘get rid’ of anger. . . only suppress it. And it seems to me that suppressing anger can have more negative consequence than just getting pissed off. Why should one feel bad about getting mad? Anger is not the most enjoyable emotion in the human repertoire, but we need it just like we need all the others. A. re only 2 alternatives of "getting angry" (if this means expressing it violently/ aggressively?) vs suppressing anger: Psychological research shows that both suppressing it and "catharsis", i.e. aggressively expressing it have unhealthy effects on both the angry person and object of the anger. Consider 2 more alternatives, (1) some may not even feel anger in their instant empathy, "not-twoness", etc. (2) Others may feel it and express it assertively, calmly, rationally, constructively, respectfully, compassionately. B. re "practicing anywhere" and John Cage. Japanese tea rituals have been "practiced" in places like Grand Central.